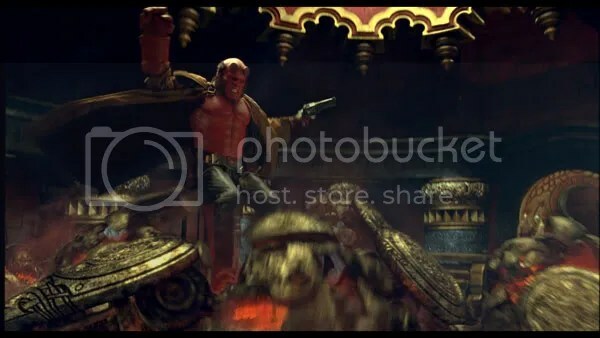 The movie Hellboy 2: trailer, clips, photos, soundtrack, news and much more! Two new preview clips from Hellboy 2, aka Hellboy II The Golden Army. I’m getting more and more interested by the movie Hellboy 2 The Golden Army! Big baby, the gun of Hellboy, is indeed a big baby! Where did he find such a gun? Such an item must be wanted…. The monster are amazing: like coming directly from Hell for real! Really nice Helboy 2 posters. They have really improved compared to the first teaser posters we had for the movie. Hellboy The Golden Army is the second installmentof the Hellboy movie series. We now have a full new set of HBII character posters. Something I didn’t like with the first Hellboy movie is that I don’t know if it’s a dark movie or a comedy… I don’t really like the mix they do. But judging from those posters HB2 looks more committed to its dark part. So I may better enjoy Hellboy 2. Those villains look really well done: they’re damned ugly! Even the Hulk or the Abomination from the Incredible Hulk look less ominous! Hellboy 2 is directed by Guillermo del Toro and is starring Ron Perlman. I wonder when they’re going to release the final poster of Hellboy 2: the teaser and art posters we’ve seen already are nice, but can’t compare with a real final poster…. Director Guillermo del Toro is back with a second installment of Hellboy. Hellboy 2: The Golden Army looks much better than the first opus. Indeed: the bad guys are quite ugly!